Help Varlyn with a contract. Jail Guards start with an Imprisoned Criminal or Imprisoned Crime Boss in play. You must destroy it to win. Jail: Creatures can't be summoned here, except by card abilities. 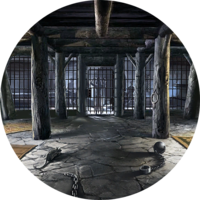 Falkreath Jail is a location in Falkreath and is one of the three initially available locations in A Traitor in our Midst. The Jail Guards start with an Imprisoned Criminal (in normal mode) or Imprisoned Crime Boss (in master mode) in play in the jail lane. You have to both kill the prisoner and defeat the guards in order to win the match. Varlyn: "I suppose you can help me on this task. The target is a criminal being held in this jail. Our job is to ensure he never sees trial - though the guards may not like that much." "You must kill the prisoner to win." Varlyn: "Good work, brother! Now we need merely escape." Varlyn: "You're looking for the traitor, aren't you? I found a mysterious note in a dead drop. From the delicate script, I believe the traitor is a woman." 2 Suppress Action 0 – – 2 Rare Silence a creature. 2 Scouting Patrol Action 1 – – 1 Common Summon a 1/1 Imperial Grunt in each lane. 3 Detain Action 2 – – 2 Rare Shackle a creature. 3 Morthal Executioner Creature (Nord) 3 2 4 2 Rare When an enemy rune is destroyed, Morthal Executioner gains +2/+0. 3 Watch Commander Creature (Imperial) 5 4 4 2 Rare Summon: Give all friendly Guards +1/+2. 3 Legion Praefect Creature (Imperial) 7 4 4 1 Common Summon: Give other friendly creatures +1/+1. 3 Suppress Action 0 – – 2 Rare Silence a creature. 3 Execute Action 1 – – 1 Common Destroy a creature with 2 power or less. 3 Fifth Legion Trainer Creature (Imperial) 2 1 3 2 Rare When you summon another creature, give it +1/+0. 3 Imprison Action 2 – – 2 Rare Shackle a creature. If you have four or more creatures, destroy it instead. 3 Haunting Spirit Creature (Spirit) 3 3 3 2 Rare Last Gasp: Give a random friendly creature +3/+3. 3 Edict of Azura Action 4 – – 3 Epic Destroy an enemy creature or support. 3 Imperial Reinforcements Action 4 – – 2 Rare Fill a lane with 1/1 Imperial Grunts. 1 Flesh Atronach Creature (Daedra, Atronach) 6 1 1 3 Epic Summon: +1/+1 for each creature in your discard pile. 1 Immolating Blast Action 6 – – 3 Epic Destroy all creatures except for one random creature on both sides of each lane. 1 Legion Praefect Creature (Imperial) 7 4 4 1 Common Summon: Give other friendly creatures +1/+1. 1 Dawn's Wrath Action 8 – – 4 Legendary Destroy all creatures in a lane. 1 Blood Magic Lord Creature (Vampire) 9 6 6 4 Legendary Summon and Slay: Put a Blood Magic Spell into your hand. 1 Mantikora Creature (Mantikora) 10 6 6 3 Epic Summon: Destroy an enemy creature in this lane. This page was last modified on 30 July 2018, at 10:57.